THE First Prayer Book was an English simplification, condensation, and reform of the old Latin services, done with care and reverence in a genuine desire to remove the difficulties of the Mediaeval rites by a return to antiquity. It has been frequently reprinted in our own time, and can easily be obtained, new or second-hand, by the reader. Here we must content ourselves with a brief summary. The "Contentes of this Booke" are fourteen in number — Preface ["There was never any thing by the wit of man so well devised " — now our second preface] ; Tables and Kalendar; Mattins and Evensong; Introits, Collects, Epistles, and Gospels; Holy Communion; Baptism; Confirmation and Catechism; Matrimony; Visitation and Communion of the Sick [including an Order for Unction]; Burial; Purification of Women; A Declaration of Scripture with certain prayers to be used the first Day of Lent [The Commination]; Of Ceremonies omitted or retained [now our third preface]; Certain Notes. Mattins and Evensong begin with the Lord's Prayer, and end with the Third Collect: no alternatives are provided to Benedictus, Magnificat, or Nunc Dimittis. Otherwise these services are the same as our present ones ; but it is compulsory to use Benedicite in the place of Te Deum in Lent, and the Athanasian Creed (printed after Evensong) is ordered for use immediately after Benedictus six times a year— on Christmas, the Epiphany, Easter, the Ascension, Pentecost, and Trinity Sunday. The Introits for the Communion consist of whole Psalms. The Collects are mainly those which we still use, but some of our best have been written later, e.g. Advent iii, Easter Even ; and some have since been expanded, e.g. St. Stephen and St. John, or altered, e.g. Innocents' Day. Introits, Collects, etc., are also given for a second Communion on Christmas and Easter Day, and for St. Mary Magdalene (the stupid omission of these from the Second Book has been since partly repaired by the insertion of the first two in the Irish and the American Prayer Books). It is in the Communion that the greatest differences from our present English Liturgy appear, though here again the Scottish and American Liturgies have gone back behind the changes of the Second Prayer Book to the model of the First. The title is "The Supper of the Lorde, and the holy Communion, commonly called the Masse." The main differences from the present English Services are as follows :— Ninefold Kyrie without Decalogue, followed by Gloria in Excelsis. Immediately after the Offertory follows the Sursum Corda, Preface, and Sanctus, followed by the prayer "for the whole state of Christes churche" (without the words "militant" etc.) ; continuing with a commemoration of the saints, "And here we do geve unto thee moste high praise, and hartie thankes for the wonderfull grace and vertue, declared in all thy sainctes," etc. Then follows the Prayer of Consecration, which includes an Epiklesis, that is an invocation of the Holy Spirit to hallow the gifts of Bread and Wine. This insertion of the Epiklesis (which Cranmer took mainly from the Eastern Liturgy of St. Basil) was a very important step. The extant early Liturgies all contain it (p. 191), as well as the Eastern Liturgies of the present day, in which it is regarded as the actual consecration of the Eucharist. The Roman Liturgy, on the other hand, has no definite Epiklesis (p. 82), and Latin theologians have for ages laid the stress on the Words of Institution, "This is my Body . . . This is my Blood." This stress was increased in the Middle Ages by new ceremonies such as the Elevation; and consequently there arose the idea that the Eucharist is consecrated merely by the repetition of our Lord's words. Cranmer probably knew that there was no justification for this idea in early Church practice, and therefore inserted the Epiklesis into the prayer Quam oblationem, while at the same time forbidding the Elevation, in the Eastern Liturgies, as well as in our own Scottish and American Liturgies, the Epiklesis comes after the words of institution ; but, by inserting them before these words in the First Prayer Book, Cranmer effected a reconciliation between the Eastern and Western ideas, obviating objections on the Western side while at the same time practically satisfying the Eastern view ; and, as it happens, there has quite recently been discovered an ancient Egyptian rite, which has an Epiklesis in this position. In view of this ancient divergence between the Eastern and the Roman Liturgies the only possible position is that of the early Church, namely not to theorize on the matter or imagine that any particular form of words is essential. Thus it cannot be said that there is a precise moment of Consecration, dependent upon a particular form of words, but only that the gift of our Lord's presence in the Eucharist is vouchsafed in answer to the prayer of the Church. THE ORNAMENTS OF THE FIRST PRAYER BOOK. Prayer of Thanksgiving, and the Blessing. The Baptismal Services contain, besides the parts which we are familiar with, an Exorcism of the "uncleane spirite," and a rubric for thrice dipping the child in the water (which is ordered to be changed once a month, and the new water blessed): but the pouring of water is allowed if the child be weak. After this, the sponsors are to take the child, and the minister to put on him his white vesture, commonly called the Chrisom, with the words "Take this white vesture for a token of the innocencie," etc. ; and the priest anoints the infant upon the head. The Chrisom is to be brought back at the mother's churching. The Catechism is printed under the head of Confirmation, and ends at the Lord's Prayer and the Desire. At Confirmation the Bishop not only lays his hand upon every child, but crosses each child on the forehead (this was revived in the Scottish rite during the 18th century). The Visitation of the Sick contains a prayer and psalm for Unction, "if the sicke person desyre to be annoynted" ; and the Communion of the Sick appoints that if on the day appointed "there be a celebracion of the holy communion in the churche, then shall the priest reserve (at the open communion) so muche of the sacrament of the body and bloud, as shall serve." For Burial, the Psalms are 116, 146, 139 (a far better selection than we now have) ; and there is a beautiful commendation and a prayer for the departed person "that his soule and all the soules of thy electe, departed out of this lyfe, may with us and we with them, fully receive thy promisses, and be made perfite altogether." The prayer, "Almighty God, with whom do live" is differently worded; and then follow an Introit (Psalm 42), Collect ("O merciful God," rather more definitely worded), Epistle, and Gospel, for funeral Celebrations. our third preface, and " Certayne Notes for the more playne explicacion and decent ministracion of thinges conteined in thys booke." The first Note orders the surplice and allows the hood for Mattins, Evensong, Baptizing, and Burying (a rubric before the Holy Communion orders the albe, vestment or cope, and tunicle for that service). 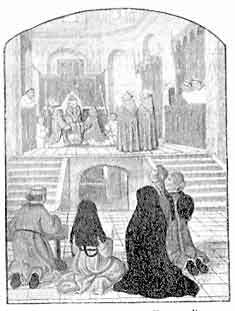 The second Note appoints the rochet, surplice, or albe, cope or vestment, and the pastoral staff for the Bishop. The third is— "As touching kneeling, crossing, holding up of handes, knocking upon the brest, and other gestures they may be used or left as every man's devocion serveth without blame." The fourth allows the singing of an anthem instead of the Litany on the Great Feasts ; and the fifth gives the curate discretion to omit the Litany, Gloria in Excelsis, Creed, Homily, and Exhortation, "if there bee a sermone, or for other greate cause." These Notes well illustrate that common sense which is characteristic of the First Prayer Book from cover to cover. It is indeed throughout an examplar of what we proudly claim as one of the best elements in the English character: alike in ritual, that is, in the wording of the services, and in ceremonial, it endeavours to avoid the extremes of bigots and fanatics, seeking to establish what is true and right without regard to prejudices, reactions, and the cruel generalizations so characteristic of the period. Catholic conservatism there is, but it is the conservatism which is not afraid of new ideas ; Protestantism there is, but it is the Protestantism that will not throw away the gold with the dross compromise there is, but it is the compromise which honestly accepts truth from both sides. It is positive, constructive, practical ; and we may safely say that, ever since it was so roughly altered at the end of Edward VI's reign, the opinion of the whole Anglican Communion has been steadily coming back to the principles of the First Prayer Book, and that every subsequent revision has restored something which the Second Book took away. In fact, as is stated in the very Act which substituted the Second Book for it, the First Prayer Book was "a very godly order for common prayer and administration of the sacraments, . . . agreeable to the word of God and the primitive Church"; but there had "arisen in the use and exercise . . . divers doubts for the fashion and manner of the ministration of same, rather by curiosity of the minister, and mistakers, than of any other worthy cause." The First Prayer Book was indeed too fair-minded for the violent and bitter spirit of the age. Our Book of Common Prayer has been like a ship launched upon a troublous sea. The ship was shattered before the end of this reign, sunk in that of Mary, refitted when Elizabeth began to reign, wrecked in the storms of the 17th century, then careened and repaired she was becalmed in the 18th, and, after steering a gusty course between the rocks of the Victorian era, she is now in the 20th century the oldest ship of a small fleet, tough and full of life in spite of her age, and sailing with a good wind, but needing again the shipwright's hand.